SANTIAGO. Welcome to Santiago, Chile’s scenic capital between the Pacific and the Andes. With a coastline more than 2,650 miles long, Chile is more than 10 times longer than wide. It has a distinctly European flavor accented with Latin flair, making Santiago one of South America’s most sophisticated and modern cities. Upon arrival, you will be met by your Tour Director, who will help you check into your hotel. SANTIAGO. Your guided CITY TOUR introduces you to Santiago—the country’s political, commercial, and cultural capital. View La Moneda Government Palace and San Cristobal Hill with its landmark statue of the Virgin Mary. Also, see Club Hipico, one of the most renowned horseracing tracks in South America. Your tour ends at the city’s main square, Plaza de Armas, with a visit to the relic-rich CATHEDRAL. Your afternoon is at leisure. This evening, consider the optional Chilean Folkloric Dinner Show. SANTIAGO - VALPARAISO (EMBARKATION). 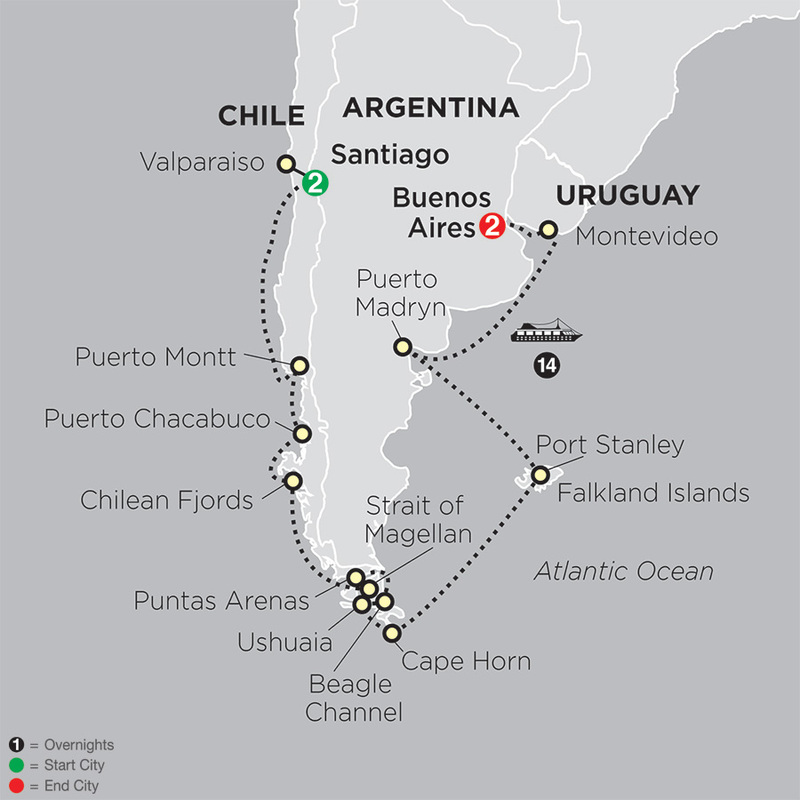 Enjoy a free day exploring Santiago before transferring to Valparaiso to board the Norwegian Sun where you will begin an unforgettable cruise around South America. BUENOS AIRES, ARGENTINA (DISEMBARKATION). Disembark your ship today in Buenos Aires. This cosmopolitan city with a great European cultural influence has managed to preserve its old traditions and charming corners. Continue to the hotel where you will have the remainder of the day at leisure. BUENOS AIRES. Begin your Buenos Aires CITY TOUR with a drive on the widest avenue in the world, 9 de Julio, passing the famous Colon Theatre, Plaza de Mayo, La Casa Rosada (the President’ s Pink House), and the first City Hall, which was built during Spanish rule. Visit the METROPOLITAN CATHEDRAL, where Pope Francis celebrated Mass when he was Cardinal of Buenos Aires. Also see the mausoleum of General San Martin, Argentina’s national hero. Stop in San Telmo to explore one of the oldest neighborhoods in Buenos Aires before continuing to La Boca with its colorful Caminito Street. End today’s tour in the glamourous Recoleta district, home to elegant boutiques, distinguished restaurants, and RECOLETA CEMETERY. See one of the most impressive monuments in Argentina, the mausoleum of Eva Perón, also known as Evita. Tonight, enjoy dinner and drinks before your professional TANGO SHOW begins. BUENOS AIRES. Your vacation ends after breakfast this morning. "Born and raised in Rio de Janeiro, I speak English, French, Spanish, and Portuguese. I became a Tour Director in 1986, and I love my work. It's so great to see guests engage with the diversity of South American countries -their traditions and contrasts. I love sharing the history of these countries, watching the group interact during the trip, and knowing I play a fundamental role in the success of the trip."